Screech and other species of owls live in the Okanagan Interior Salish Region of British Columbia due to the plentiful food supply and temperate conditions. 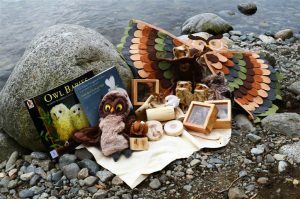 To the Okanagan Syilx people, the owl or sninaʔ is a teaching character, used to show children why it is important to listen to their parents, elders and caregivers. For the Syilx people of the Upper Nicola Band, owls are also considered guardian spirits for hunters and warriors, as well as spirit guides to other worlds.